PPCTS SUCCESSFULLY LAUNCHES NEW SMARTFOLD 1100SL ULTRA X FOLDER GLUER AT IADD/FSEA ODYSSEY SHOW. 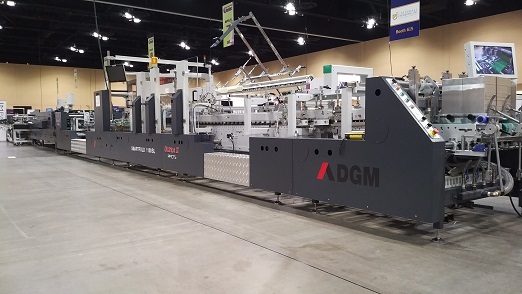 June 10, 2017 - The new PPCTS/DGM SMARTFOLD 1100SL ULTRA X folder gluer for folding cartons was successfully launched and sold at the recent IADD/FSEA Odyssey show in Schaumburg IL. The extra length and faster Smartfold ULTRA X is equipped with motorized carriers, job memory recall, servo drive technologies and many more features for fast changeovers to maximize uptime and productivity. The SMARTFOLD 1100SL ULTRA X is the latest addition to the PPCTS SMARTFOLD folder gluer family and the bigger brother of the ULTRA that was also successfully launched by PPCTS last year.